Michael Peña wears the sporty and classic Oakley Radar Pitch in the movie End of Watch. This is the personal favorite of most law officers, as it offers 100% UV protection. 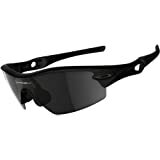 Like in the movie, these sunglasses are perfect for a law enforcement officer or anyone who spends a lot of time outdoors for that matter. Not only do they look cool but also keep your eyes cool.